Day two in Colonial Williamsburg - it was pouring down rain all day. This post will probably ruffle some feathers, but I feel compelled to report on my experience concerning faux silk - yup, polyester, the fake stuff - and the day I was never so happy to have a polyester dress in my life. I have been to Colonial Williamsburg three times now, three different times of year, and each time it has rained. I hate the rain, but my silk gowns hate the rain even more. I will survive, but silk taffeta dresses will not. So what's a pretty pretty princess to do? I wasn't about to sit home and mope - I flew all the way across the country to play dress-up in Williamsburg, and by golly, I wasn't going to let a little rain stop me! Except it did stop me. I was freaking miserable. My feet were wet, my epic silk bonnet was soaked, my cotton petticoat was sagging, but what still looked great? Now, not all polyester taffeta is created equal. 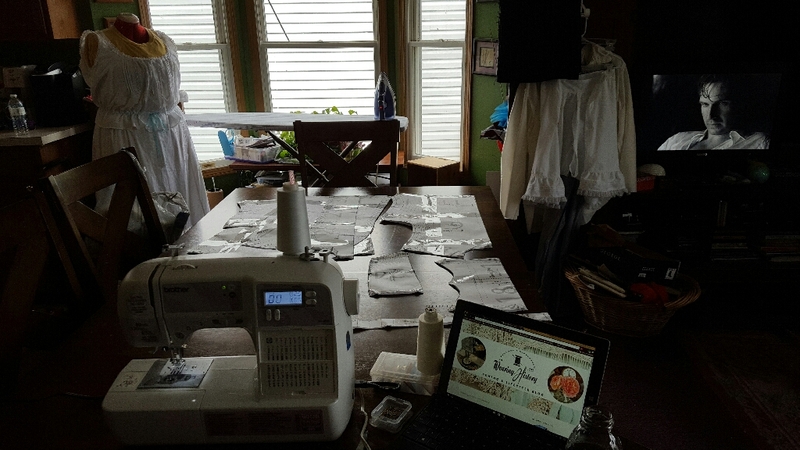 There is a lot of poor-quality faux silks out there, fabrics that look as fake as they are, that are difficult to sew, that have poor hand and no crush factor. These, I implore you, are to be avoided. But there are *good* faux silks out there too. Really good. Can-hardly-tell-the-difference good. Easy to sew, easy to press, correct sheen. These polyesters are fantastic fabrics to use for wet-weather costuming. Polyester is an interesting fabric. It's hydrophobic, which means that moisture is dispersed evenly through the fibers. So when the rain attacked me in my red dress, I was wet through, but you couldn't tell by looking at me. The faux silk did not keep me dry, but the fit, shape, and puff of the gown were unaffected. Most importantly, I did not worry about the dress, whereas if I had chosen to wear The Creature that day, it would have been utterly, permanently melted within minutes. We're smiling, somehow. I was happy to be inside. The argument, of course, is to wear natural, historical fibers like linen, cotton, and wool. Fair enough, and I agree, but there are also times when you just want to be a princess. There are times when your treasury may not allow for a real silk gown. There are times when it's going to rain on your holiday, but you're still going to get dressed and go out. Those are the times for a good faux silk gown. There are times not for a good faux silk gown, too. Skip the faux silk when it's going to be hot. Skip it when you're attending an event where you may be scrutinized for historical accuracy. Avoid faux silks if you are going to be interacting with fire, open flame, ovens, etc. If you feel uncomfortable for any reason in choosing a faux silk over a real one or another fiber, skip it. crumple the fabric in your fist and see how it reacts when released. You want it to "crush," not spring back to its original shape right away. I have made a few gowns out of faux silk and you CAN find the stuff at drapery stores and in the home dec areas. It looks and feel like silk but you can throw it in the wash and voila! It's as good as new! I for one cannot afford real silk for every event and I am often dancing and sweating and spilling champagne (ok not often) so I NEED washables! Thank you for the post! I once spilled lemonade all over a vintage 1950s taffeta dress....I freaked out, but thank goodness it was cleanable. I'd like to not repeat that experience again! Thanks for the post. I have a feeling this is the skeleton in many ladies' closets. Yes, sometimes budget and durability have to come first, especially if you wear this stuff a lot. I agree that it has to be nearly undetectable though. Yes, that's the key. It has to be really really good faux silk, undetectable as you say. Great tips, Lauren, and let's hear it for faux silk! Now, I'm usually a silk snob, but there's a time and a place for the real stuff and for the fake stuff. 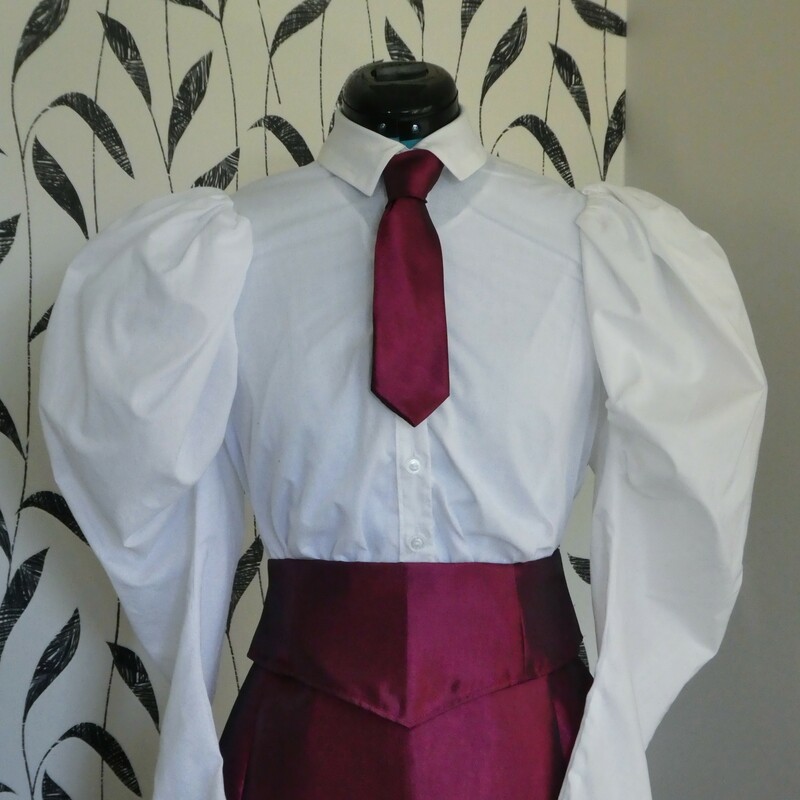 For a Steampunk ensemble I used a gorgeous--absolutely gorgeous--faux silk taffeta in an iridescent plaid (purple, blueberry, magenta--delicious colors!) that I found in the holiday collections aisle of the local JoAnn's. It was a heck of a lot cheaper than real silk, it's beautiful, it crushes and scroops almost like real taffeta, and it has a beautiful hand, drape, and sheen. I love it. Best of all: throw it in the wash. Sure, it wears like a raincoat for dancing, but real silk would be almost as hot AND get sweat-stained. I even purchased some more from the same collection for another Steampunk ensemble. Honestly, I wish they'd make more of it. Since I'm using it for non-historical 'period' dress-up, I don't care that it's not real. But even if I was going for a period-accurate appearance, I don't think I'd have a big problem with it. Most people are utterly convinced that it's silk taffeta. Sounds like a great find! 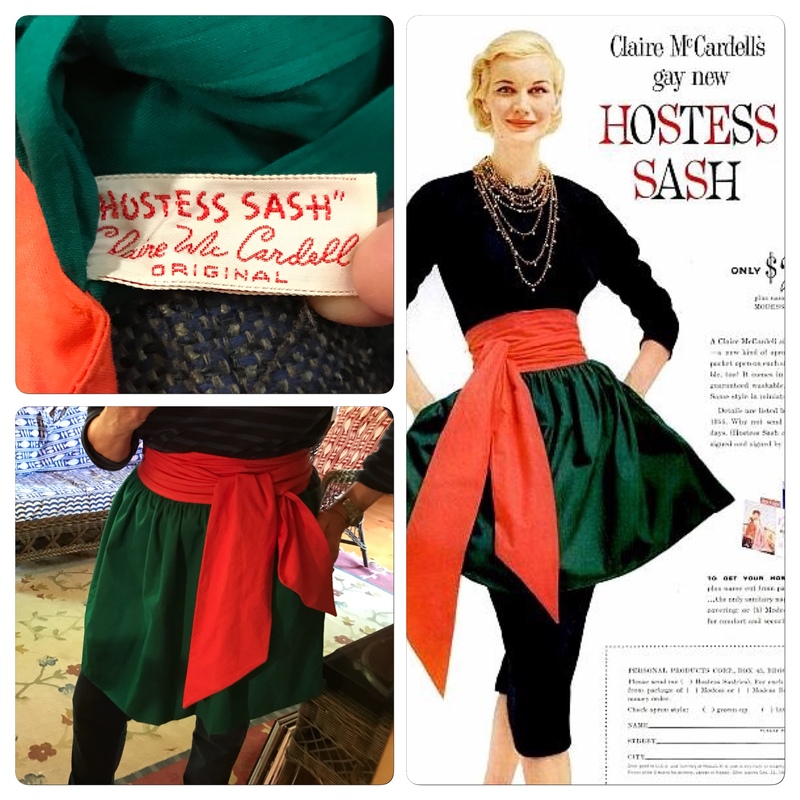 The good stuff is out there, you just have to search for it (like real silk taffeta, too!). "real silk would be almost as hot AND get sweat-stained" -- People forget that silk is an insulator. It traps heat like crazy! That's why silk long underwear can be so cozy. Silk taffeta is the same way. So for those always saying you'll be more comfortable in natural fibers, not always true. I LOVE silk long johns! Such a RELIEF! 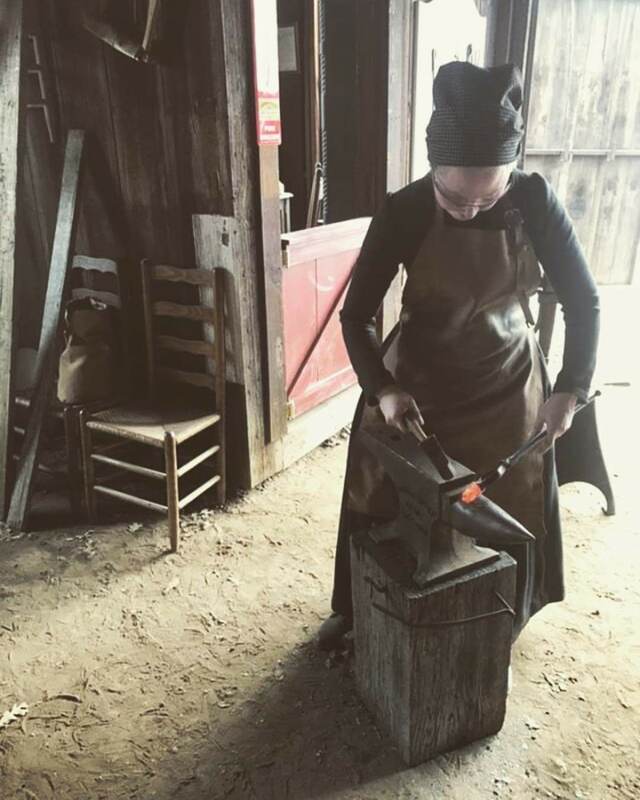 I was just thinking about starting some sort of historical costuming, but I've always been put off by the idea that I had to invest in the real, expensive stuff for every piece. (Especially as a beginner, that just seems like throwing money away in the learning process!) This makes me feel a lot better about finding a good, but cheaper, option and being okay with it. I had this experience with a vintage New Look dress in a still-stunning magenta faux silk moire, which wore gorgeously all night long and then was sopping wet by the time I made it to my car in the rain. 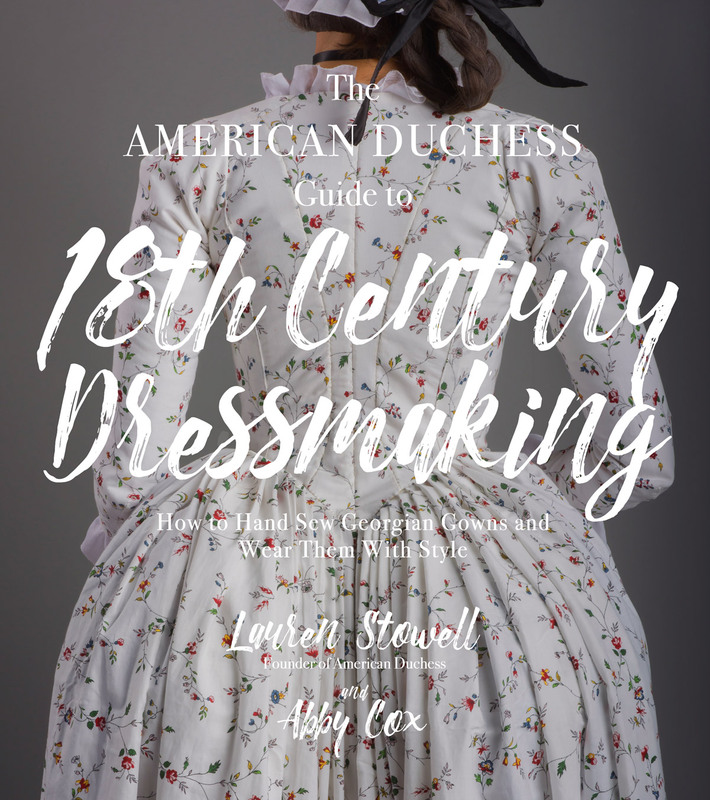 The dress is actually fascinating, in construction and provenance (made in the UK and large enough to fit me, which is extremely rare; it's a modern American fourteen or so). But it dried PERFECTLY and the moire was just as beautiful after as before. It's well made and also enduringly beautiful. Your faux silk is lovely, and ... yep, still not tired of that bonnet! Excellently written Lauren! I use faux silk when I can't find the color in silk I am looking for and when my pocket book looks at me askance, cackles maniacally, and says, "Yaaaaaah, I don't think we can swing this at this time." There are some pretty fabulous faux out there!! Your red dress looks incredible!!! Indeed! And thank you! My pocketbook sometimes looks at me askance too, lol. In the case of the red dress, I made it quite awhile ago, when we'd first started the shoe company, so my pocketbook at that time was screaming even over the faux stuff! Yay for faux silk! I'm all for it, and I tell anyone who asks that its a silk blend, aka faux. And you're right, it looks, feels, and handles like the real stuff, and it machine washes. I can make many more dresses and make more mistakes, using it. Now I just wished somone would make printed faux silk in florals and stripes and spots. Wow, it really does look just as amazing as real silk! That is such a beautiful dress - and the colour! So incredible! It's definitely a process. I would say familiarize yourself very well with the natural fibers of the period, so you know what will and won't work in a blend of synthetic. I agree! The dress is beautiful and looks totally accurate! It also happens with wools, etc. If you choose the right one, the differences are slightly visible. Natural fibers also shine! Indeed - I'm glad there are really nice faux silks out there to give vegans an alternative. 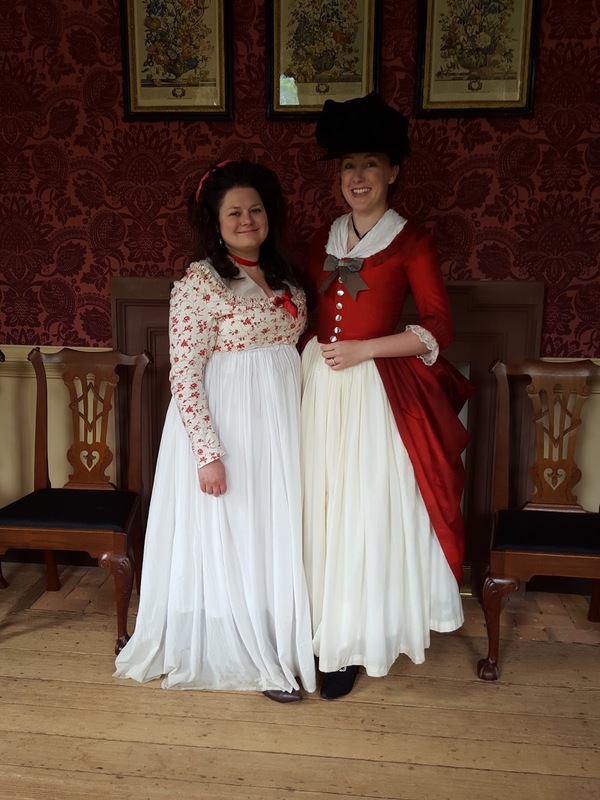 I've used curtain material (faux silk) for my red 18thC dress and I love I can get the look without the worry. Plus it was cheaper than buying 100% cotton! Fortunately I wear it for comicons so no one is checking the HA factor. 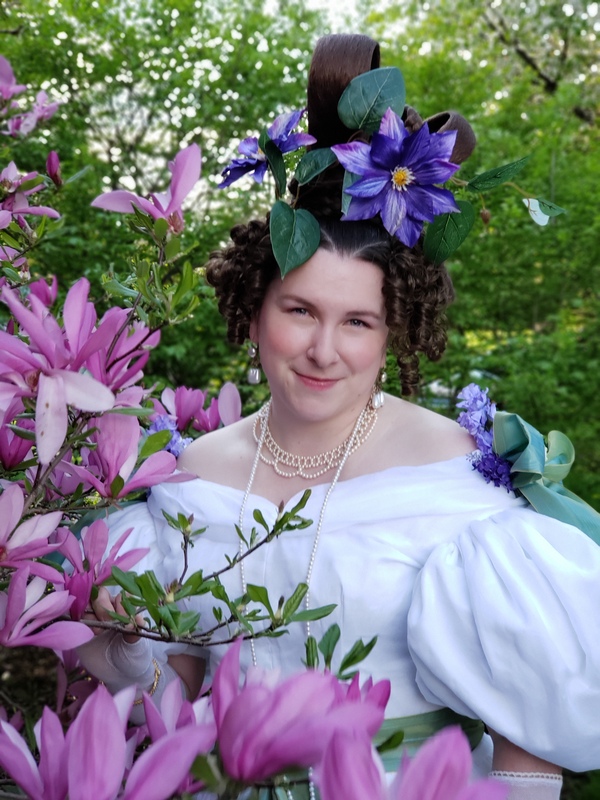 I played the young Queen Victoria for a historical interpretation company around 10 years ago, and the role involved being outdoors at garden parties in the grounds of many UK stately homes - in all weathers. Thank God for faux silk! My 2 dresses, made by me, survived 4 summers of intense heat, driving rain, showers and mud, as well as having a couple of ice creams dropped on them by toddlers who came tottering over to kiss the Queen! They went in the washing machine and came out looking fine. Well done Lauren! You look fab, as always. That's the dresses going through the washing machine, not the toddlers! I also think we can't forget how many non-silk options there are, too. 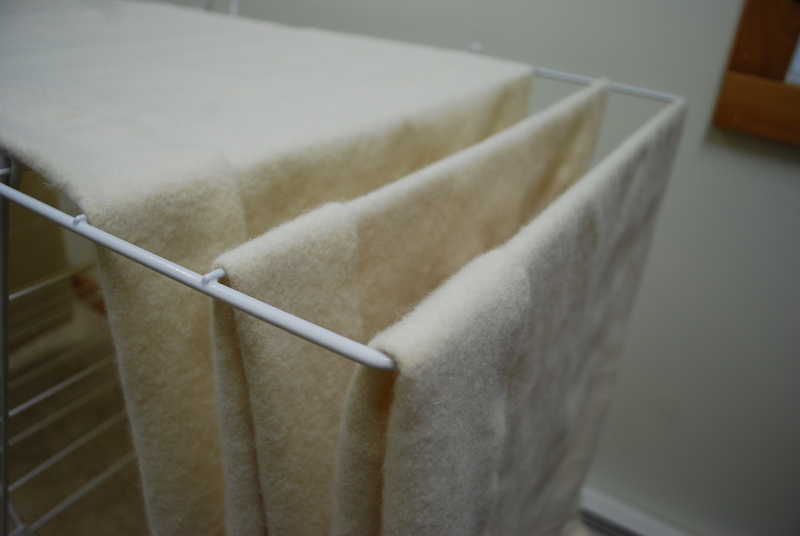 Wool, linen, and cotton won't be negatively affected by a little (or a lot of) rain, are typically washable or dry-cleanable, and any or all may be good choices for the garment you want to make. If using manmade fibers doesn't conflict with your goals, peachy! But if it does, there are LOTS of non-silk options to play with. Sometimes I think silk gets put on a pedestal (Making new gown, ZOMG it must be silk)--but one of the fun things about both costuming and reenacting is exploring the variety available to us! And I am totally behind you on NEVER wearing polyester around an open flame or fire. The melt potential from an accident is nightmare fodder. Definitely. Wool, linen, cotton, all natural fibers, period fibers, and well-suited to bad weather. 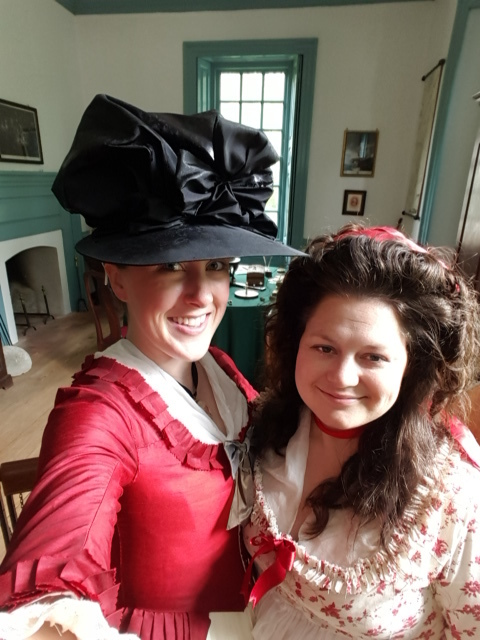 I was so thankful to have the Chemise a la Reine, as it was an amazingly practical dress in the rain as well as the heat. 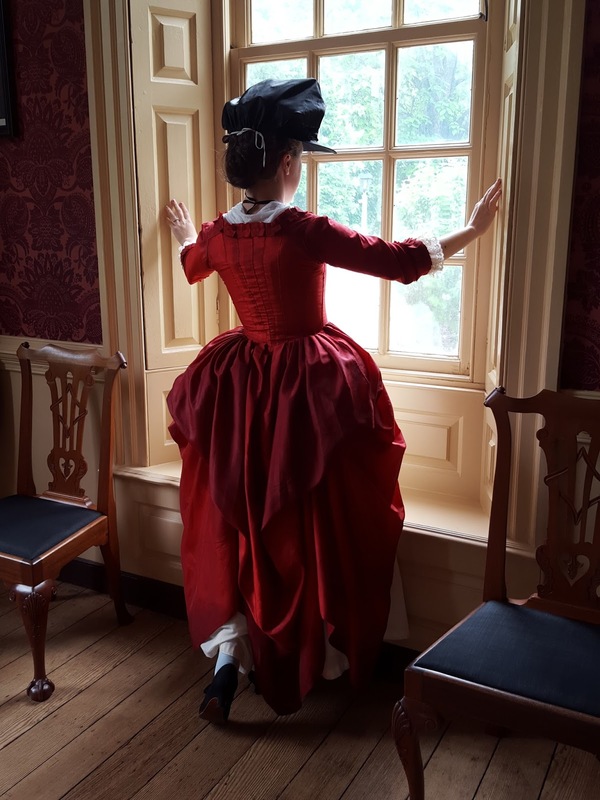 I also spent a good 45 minutes hiding inside one of the house tours because it suddenly started pouring on an otherwise sunny day when I'd chosen to wear a silk taffeta petticoat. The women of the time must've dealt with these things too - choosing the wrong dress on the wrong day, lol. The idea of faux silk is tempting. It's cheap, it's (sometimes) very close to the real thing, you can throw it in the wash and it can weather the rain. But there is one drawback that I just cannot ignore - the most expensive thing about my gowns is never the fabric, it's always the time I invest in them. The math never works in favor of faux silk. 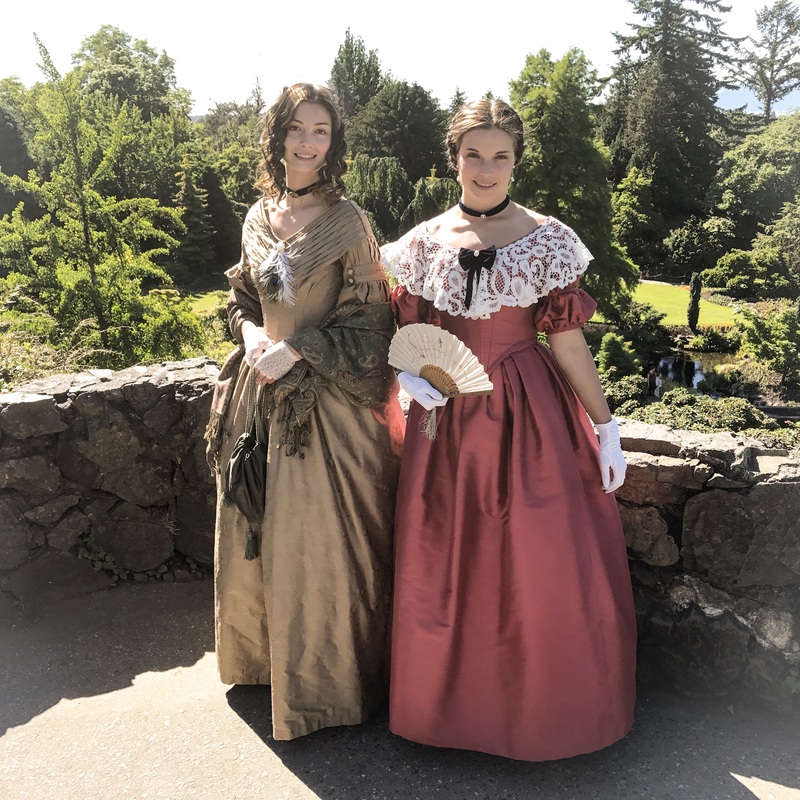 Indeed, it is the time and effort that goes into the gown that is the most "expensive," but just imagine for a moment that you spent all that time and effort to make a splendid dress to wear to a historic site, you wear it, and it suddenly starts pouring down rain. Your dress is ruined, utterly ruined. That's exactly why I took this faux silk red dress to Williamsburg. I had planned to wear my all-silk polonaise, or the cotton jacket with the silk petticoat. Indeed, before I checked the weather, I had planned to take ALL silk gowns. I'm so glad I rethought that!! Wow. I would have never guessed that dress was faux silk. And that bonnet is EPIC! I must get that pattern soon! See, if I'd never pointed it out, nobody would have known! The bonnet is awesome. I love it to pieces - consequently, it got ruined in the rain, but only the brim buckled and I just need to replace it with a new piece of cardboard. Phew! I have a contrariness problem, and so while I personally am all about fabrics that are as accurate as possible when I'm sewing, whenever I see fire safety put forth as the main reason against synthetics I get more pro-poly. It's hard to advise all people for all situations, but with the number of casual/civilian/costume events these days, it's a bit self-centered to assume that everyone's in a camp with open flames! 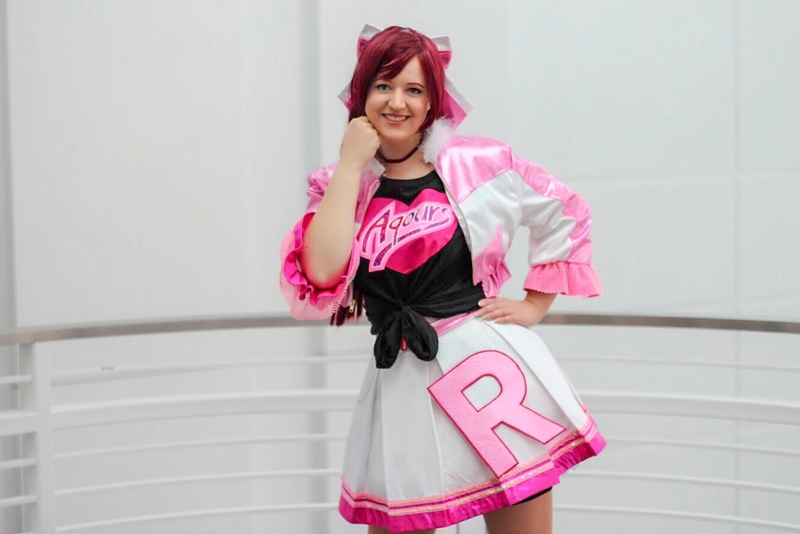 Oh also, that's the dress you were making when I first found your blog so it's definitely my favorite. I think I may need to make myself one of these! I can't really do real silk for myself in a gown, because I can't wash it. I unfortunately sweat to much to not be able to wash something. And it looks great, I would never have know it was faux if you didn't say! I do have the tendency to stick my nose up at 'fake' fabric, but I think you are absolutely right that it has a place in costuming. Hi your dress is lovely!!! I was wondering if you could recommend a website to purchase good quality faux silk?? Thank you! !